I have always relied on magazines such as yours to provide accurate reviews of new products before spending the cold cash to purchase a new program. 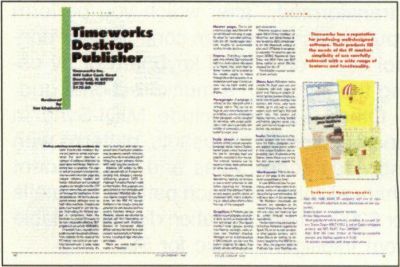 In the past, your reviews have been very informative and accurate However, your review of Timeworks Desktop Publisher ST (January 1989) didn't mention two major limitations. Using floppy disks, the program requires multiple disk swaps and is painstakingly slow at times due to the extensive disk access during creation and printing of documents. With a floppy-drive system, your document size is limited by disk space more than memory. Trying to print a two-page document with 12 graphics on a 1040ST with two double-sided drives resulted in an out-of-disk-space error. This was the only document on the disk. If you have a 9-pin printer, you cannot print the page sideways. The landscape choice prints the page vertically in two sections that must be cut and pasted together. Even then, the right half inch of the page was not printed. I don't blame you for missing this in your review, since you most likely tried Publisher ST on a hard drive and with at least a 24-pin printer. But I do think that your readers should be aware of these limitations. When reviewing a product as complex as Publisher ST there are bound to be some details that get missed. We thank you for sharing your observations with us and our readers.